The Beara Peninsula in west Cork is one of Beyond the Glass Adventure Tours favourite sections of Ireland’s Wild Atlantic Way. Each of our multiday hiking and cycling tours travel through a section of the peninsula. 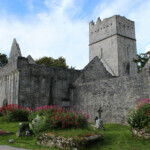 Whether you are travelling to Ireland independently or as part of a group holiday the area has much to offer. 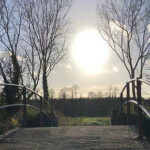 In this article we outline some tips of things to do, some of our favourite parts and a little history of the area!!!!! The section of the N71 that connects Glengarriff to Kenmare is known as the Caha pass, named after the mountains it passes through. It is a ruggedly scenic drive, with views of the mountains, Bantry bay to the south and Kenmare to the North. In sections the road tunnels into the mountain which adds to wildness of the place. The peninsula that stretches out to the west of this road is the Beara peninsula, and it is one of the magical parts of Ireland’s Wild Atlantic Way. The name ‘Beara’ stretches back to mythical Ireland. Legend has it that the king of Ireland Owen Mór lost and got badly injured in a battle against Conn Céad Cathach. After Owen recovered from his injuries he sailed south towards Spain to seek help from the king of Castile to win back his lands. While in Castile Owen fell in love with the king’s daughter Princess Beara. He brought her with him back to Ireland and when he married her he named the region in her honour. 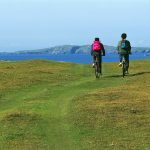 The topography of the peninsula makes it a perfect destination for hiking and cycling tours and it has some of the best hikes and cycle routes in Ireland. 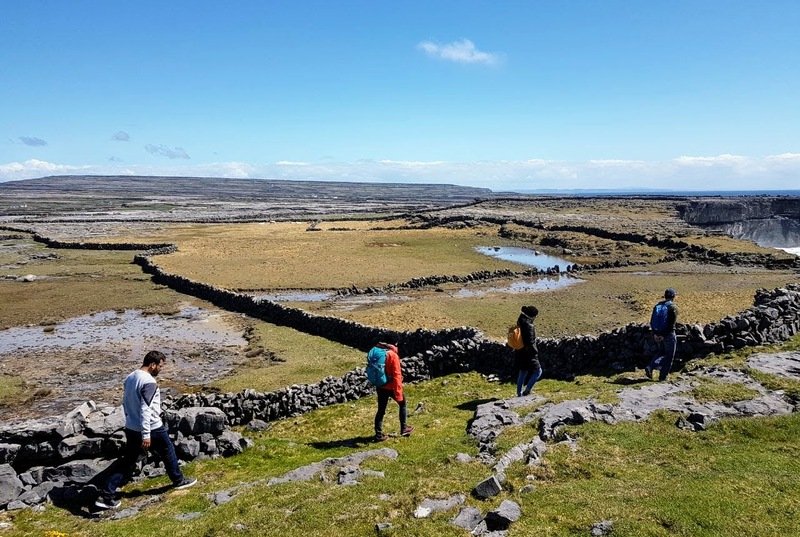 If you are an inexperienced hiker or you are not travelling as part of an organised walking tour to Ireland then do not worry as there are many accessible options in the region. 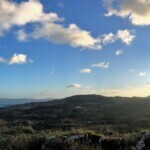 There are some easy day hiking tour options in Glengarriff Nature Reserve. Here there are looped walks ranging in length from 0.5Km to 3Km. There is parking and the routes are all marked. On these walking trails you will be trekking through native Irish woodlands of Oak, Ash and Holly, Lichens and Ferns and alongside streams and rivers. Some of the hikes offer rewarding views out over some majestic landscape. 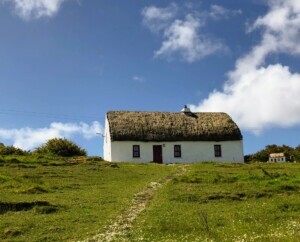 An option for a hike of medium difficulty and one of Beyond the Glass Adventure Tours favourite walks in Ireland is the excellent looped walk around Dursey Island, Irelands only island connected to the mainland by Cable Car. It is a shorty trip in the cable car trip over the Dursey Sound onto the island. The walk is marked and it takes approximately 4 hours to complete the hike. It is important to note that there are no shops or accommodation on the island. So, do bring some food and take note of the times of the last Cable Car off the island. If you prefer a more challenging day out on the mountains there are also fantastic hill walks in the peninsula. Two of Ireland’s best hikes, for the more adventurous, are hungry hill which rises to 682 meters over the village of Adrigole and can be seen from much of the peninsula and the hills of Coomacloghane and Tooth Mountain on the northern side of the peninsula near Glanmore lake. Before you set out on these hikes be sure that you are comfortable navigating on open mountains and be prepared for changeable weather. West of the town of Castletownbere the landscape is rugged and dramatic and as a result the roads are narrower, which prevents the larger tour busses travelling further west. 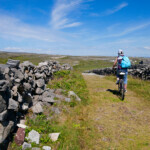 These quieter roads are ideal to include in any cycling holiday in Ireland. During our 6 Day Adventure Tour we cycle a route from Castletownbere, heading west on the R572 turn right on a minor road on the western end of the town. The road steadily rises as views of the ocean start to come into view. Soon the road passes the Derreenataggart Stone Circle, it is almost hidden and if you were not looking out for it you would easily pass it by. The entrance is marked by a small sign post that can be obscured by the hedge overgrowth. This stone circle is definitely worth a stop and visit. After some more beautiful cycling with sweeping bends and adrenaline inducing quick descents you will re-join the R572. Further west along the R572 you will reach a turning to your left to the Buddhist retreat centre of Dzogchen Beara. The turning is marked by a number of prayer flags on tall poles, which are almost always blowing in the wind. Dzogchen Beara offers spiritual retreats and it is set in magnificent surroundings with its meditation room perfectly perched above the Atlantic Ocean. Visitors are welcome and it is worth calling in to see the views and have a bite to eat in their café. After you have had refreshment at Dzogchen there are two options. For a longer cycle you can cycle west and join the R575 to the village of Allihies, loop on to the R575 to Eyries and back via the R571 to Castletownbere. If you want a shorter day cycle you can return on the to Castletownbere from Dzogchen Beara and enjoy the treat of it being almost entirely downhill. Bear Island is a short ten-minute ferry ride from the main land. A cycle around the island makes for a fantastic day out. If you do not have your own bikes you can rent bikes from ‘Bike n Beara’ who are located on the eastern side of Castletownbere. From the bike rental shop cycle east on the R572 2.7Km to the small harbour to board Murphy’s ferry to Bear Island. The ferry lands at the village of Rerrin, here there is a small shop and café. From Rerrin cycle east to see the abandoned British military batteries. Then you can cycle west the length of the island. You can choose between the high road or low road, both equally beautiful. 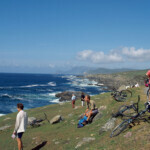 Although the island is hilly, most of the cycling is not too strenuous and any steep sections are easily walked. There are fantastic views out to the Atlantic, across to Sheep’s head and back to the mainland. The island roads are quiet, winding and lined with wild flowers and bring a sense of peace and tranquillity as you make your way gently around the island. At the western side of the island you can catch a ferry with the Bear Island ferry company which returns to the town of Castletownbere. Here you can get lunch before the short cycle back to ‘Bike n Beara’. This route fits perfectly into any cycling holiday in Ireland. 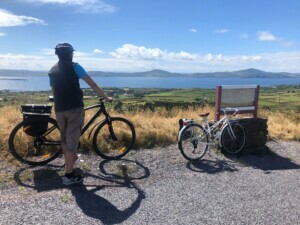 Beyond the Glass Adventure Tours favourite way to explore any region along Ireland’s Wild Atlantic Way including the Beara peninsula is through one of our hiking and cycling tours, this way we can get under the skin of its wildness and rugged beauty. 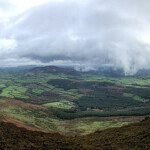 If you are interested in joining our guided hiking and cycling tours of Ireland we would be delighted to hear from you. But no matter how you explore it or what it is that you are searching for, the Beara Peninsula will not leave you disappointed. 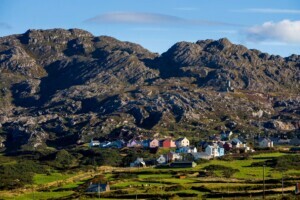 Through the towns, the colourful villages and scattered through the countryside of Beara there are museums, cafes, art studios and unexpected treats that will keep you entertained while you explore and will have you longing to return once you leave. Have you ever been away in a beautiful location for a period of time and you begin to take where you are for granted? When I am leading tours and spend extended periods of time in the outdoors there are times when I begin to take where I am for granted. Then I cycle around the next headland or hike over the next horizon and I am greeted by a view which stops me in my tracks and brings me right back to the current moment. An 8 Day Adventure Holiday on Ireland’s Wild Atlantic Way, with its spectacular scenery combined with the ever changing light from the ever changing weather, is full of such re-grounding moments. I had one of these moments as I guided the tour group up Errisbeg on Sunday morning. Errisbeg is a mountain in miniature, for a 300-meter-high mountain it packs a mighty punch. It is rugged, has steep rock faces, hidden lakes and it even has four summits. 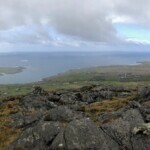 From the summits there are panoramic breath-taking views of the Atlantic Ocean, the fishtail beaches of Gorteen and Dogs bay, the countless lakes and bog lands of Connemara and beyond this are the higher nobler mountain ranges of the Maum Turks and the Twelve Bens. The tour group hiked to the top of the mountain with a small amount of effort. The few passing rain showers that fell did not dampen the groups spirits in anyway. This was a fantastic way to start day 7 of the 8 day Adventure Holiday on Ireland’s Wild Atlantic Way. After the hike we got back on the tour bus and continued west through Ballyconneely and passed the Coral Beach at Mannin Bay. The next stop was at Derrigmlagh Bog which is the site of Marconi’s first permanent transatlantic radio station and the landing site for the first nonstop trans-Atlantic flight by Alcock and Brown. Here we enjoyed the gentle 5 Km walk with interpretive points along the way. At one of the interpretive points we learned the calling sounds of some of the birds in the region. This resulted in plenty discussion among the group and we attempted to identify the skylarks and meadow pipets call as we completed the walk. 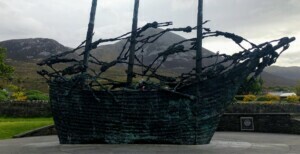 We continued our Adventure Holiday on through Clifden and took the N59 northwards on the Connemarra loop. We stopped in the lovely village of Letterfrack for lunch and browsed around the village craft shops. The next stop was at the picturesque village of Leenane, which sits at the head of Ireland’s only true Fjord, Killary Harbour. Leenane has been used for the location of some great films down through the years and when you visit it and see its scenic location you can understand exactly why. Leaving Leenane, the tour settled in for the final leg of the day as we travelled towards Westport. Crossing into county Mayo we visited Aasleagh waterfall and the Doo lough Pass. We took a quiet moment by the shore of Doo lough, and here I recalled the memory of the fallen victims of the Potato famine, particularly the victims who tragically died on the infamous March of 1849 from Louisburgh to Delphi lodge, where they were refused aid from the English landlord. We spent the night in the town of Westport. Here there are many good quality restaurants to eat and some great Irish pubs to have a pint, and we did exactly that. On the final morning of the 8 Day Adventure Tour we started the day with a hearty breakfast in our Westport bed and breakfast. We then travelled to Newport where we enjoyed a wonderful cycle on the great western greenway to Mulranny. The last stop of the tour was Mulranny beach and salt flats where we had a gentle walk. We were blessed to be the only ones on the beach. There was an air of calm with the mixed song of the ocean, bleating sheep and singing birds. A suitable end to a magnificent 8 Day Adventure Tour on Ireland’s Wild Atlantic Way. 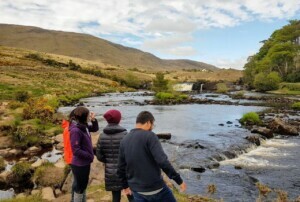 Posted in Adventure, Cycle Tours Ireland, Explore, Hiking Tours Ireland, Wild Atlantic WayLeave a Comment on Roundstone to Westport – Day 7 and Day 8 of our 8 Day Adventure Holiday on Ireland’s Wild Atlantic Way. 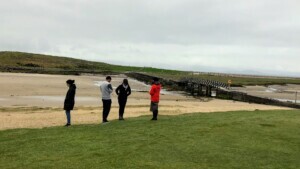 The following is a brief description of day 6 of our 8 Day Wild Atlantic Way Tour taken this May 2018. 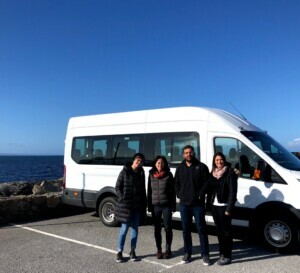 We began the adventure tour traveling west from Galway into Connemara. For the entire mornings journey the Atlantic waters of Galway Bay were on our left and beyond the Bay was the Burren of Co. Clare. As we travelled into Ireland’s west there was a noticeable change in the landscape, the fields were smaller and less arable but the scenery grew in its splendour. We had our first stop in the lovely village of Spiddal, for a stroll on the Pier and a look around Spiddal Craft Village. Ready for a great day ahead. From Spiddal we continued on deeper into the wild Connemara landscape as far as Rossaveel where we boarded the ferry to Inis Mor – the Largest of The Aran Islands. During the 40-minute crossing the ferry was escorted by the Gulls, Cormorants and other sea birds that are abundant in this area. We disembarked the ferry on Inis Mor, got on our bikes and took the road west on our Cycle Tour towards the fort of Dun Aengus. Very quickly we were alone on quiet country roads where we passed thatched cottages, deserted villages and religious ruins. It was a relaxing cycle with plenty time to take in the views. Dun Aengus is an Ancient stone-built fort. It was first constructed around 1100BC and added to over a number of periods. The structure present today dates from the early medieval period. Anyone who visits the fort is left in awe, and this tour group were no different. The ancient fortress perched 300 feet above the sea below is magnificent. On this day we had the luck of the Irish on our side – the weather was lovely. The Sun was shining, there were blue skies and a gentle breeze blew in from the Atlantic. The Tour had plenty time to soak in the history, the views and the weather. 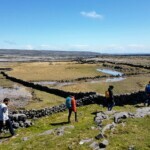 After leaving Dun Aengus we went off the beaten track and took a stroll through some fields. The geology of the Aran Islands is karstic limestone similar to that which can be found in the Burren. 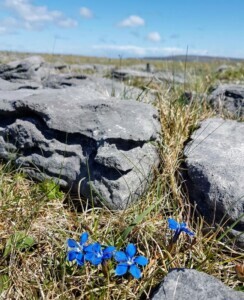 The landscape here supports a variety of flowers that you will not find elsewhere in Ireland and are more likely to be found in Alpine areas. Today we were very lucky to spot some flowers including early flowering Orchids and Spring Gentians. For the cycle back to the village of Kilronan we took the lower road via the Seal colony. On this trip we did not see any Seals, still, the views across the sea to the main land and the Connemara mountains filled our senses nicely. In Kilronan we had a relaxing lunch and a rewarding pint before getting the return ferry and jumping into the tour bus for the short drive to Roundstone. Here, we had a well-earned dinner in the lovely Vaughans Restaurant at the Roundstone House Hotel before retiring for the evening after a really rewarding day on Ireland’s Wild Atlantic Way.